﻿Guilin, one of the world’s famous tourist attraction spot of China, is famous for its fabulous Karsts (limestone) mountainous topography. Major tourist spot is the Xianggong Hill, which is on the west shore of the Li River, between Huangbu Tan (Yellow Cloth Shoal site) and Nine Horses Mural Cliff sight and is famous as a photographic spot. Hiking around the hill, too is amazing, not only because of mesmerizing views but also because of wonderful local people. Xianggong Hill is 57 kilometers drive from Guilin city and about 28 km from Yangshuo town. 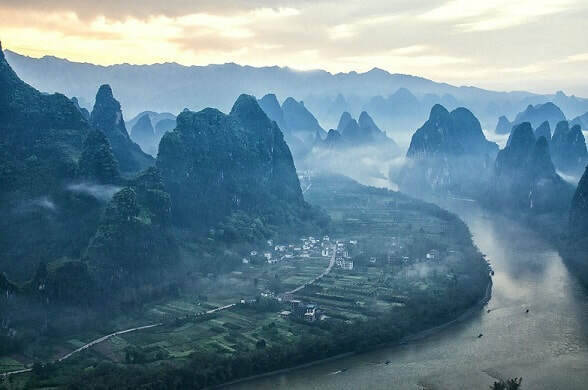 The road has various viewpoints to capture breathtaking views of the famous karsts of Xingping, and beneath, the Li River winding its way through the jagged peaks. The view of the karsts fading into the mist, the further away they get is stunning. Xianggong hill has an elevation of 200 meters and a straight height of 50 meters. Mostly tourists visit the hill at early morning, the best time for photography. Interested in visiting Xianggong Hill on a Tour? Wendy Wei Tours offers a variety of different packaged tours as well as custom tours including visiting Xianggong Hill, among other attractions and destinations. To find out more, please visit our Tours page or Contact Us directly to find out more.